Wedding Cake cannot be added to 30 minute receptions. 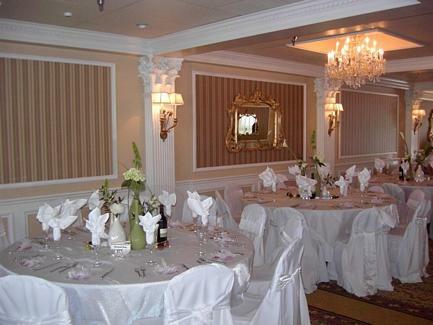 Receptions for more than 50 guests are held in the above pictured, beautiful indoor atrium with live trees. If you are interested in having a reception for more than 50 guests, please contact us for further information. *Does not include 18% Catering Service Fee, for set-up, serving, and clean-up. All mini-receptions are tray passed, butler style (like a cocktail party). There are NO reception tables set-up. 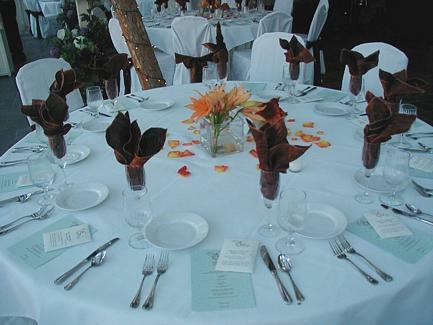 Tables are $20 each to add (seats 5 people per table) and includes white linens. The payment in full, is due four weeks before your reception. The following packages are for small intimate receptions and include the reception to be held on beautiful lawn next to the lake, immediately following the ceremony for parties with 50 guests or less (if you are having more than 50 guests, please contact us for more information). If you are interested in adding a wedding cake, please inquiry about available cakes and pricing. There is a $50 service fee for any wedding cake added. This includes a cake table, linen, plates, forks, and a server. For mini-receptions, open bar is not an option. The ONLY drink options available are listed.